Spot the famous upper-lip fuzz with the Great Moustaches mug. LIP SERVICE: According to the folks at Annie's Blue Ribbon General Store in Boerum Hill, they just can't keep anything moustache-related on their shelves. 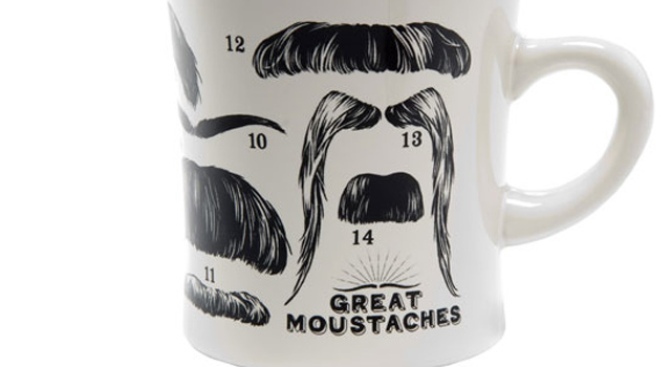 Case in point: We picked up this Great Moustaches mug -- adorned with 14 famous instances of facial hair (answers are at the bottom of the mug) -- there a while back, and now it's out of stock. Luckily, we found it online at Shakespeare's Den ($9.95), so you can have as much fun over coffee as we do. More information and ordering here. SWEET STEAL: Let's face it: Even at sample sale prices, the Italian sexpot styles of Dolce & Gabba are never going to be cheap, but a $400 pair of cigarette jeans still beats one for $800, si? (The discounts on bags will be even better.) 6/16-21, Metropolitan Pavilion, 125 West 18 Street at 6th Avenue; (877) 703-4872. NUIT BLANCHE: The bridal savings keep on coming! This week, score gorgeous wedding gowns -- raw silk, embroidered this, beaded that -- from the atelier of the always-fabulous Carolina Herrera. Wait for it: We hear some styles will be slashed from $9,000 to less than two. That's almost worth getting engaged for. (The same sale will feature dresses from Rena Lange.) Through 6/18. Soiffer Haskin, 317 West 33 Street at Eighth Avenue; (718) 747-1656.